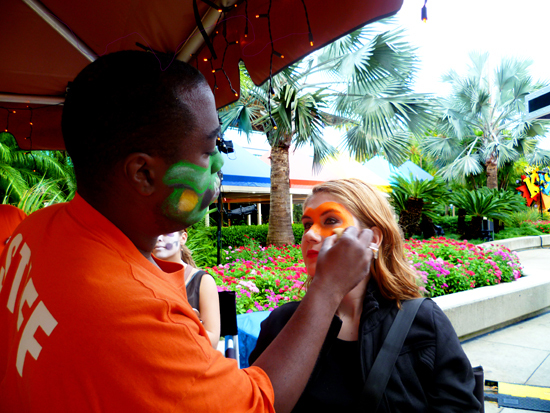 The Joy of Fashion: Orlando Day 3, Part 2: Halloween Horror Night! **Yes, that's right everyone, that spooky creepy Pumpkin is ME! Hahaha very different from my usual cute and happy self huh?! 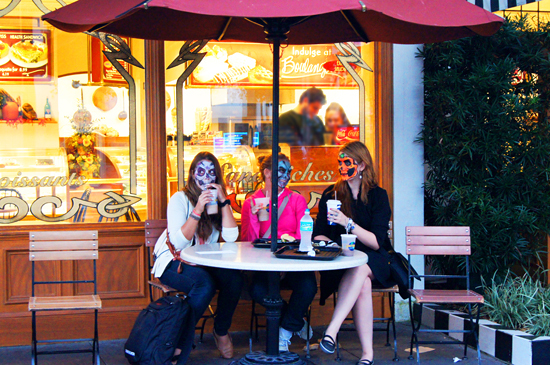 As I said in a previous post, today we went to Islands of Adventure, Universal Studios, and the Halloween Horror Night. 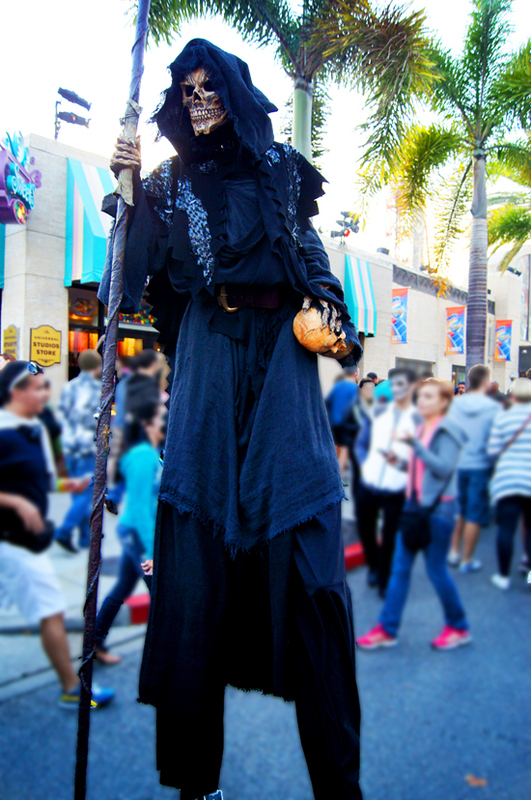 Here are the spooky photos from the Halloween Horror Night at Universal Studios!! 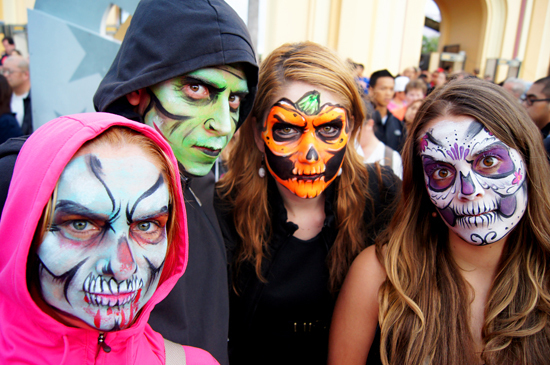 It wasn't our original plan for all of us to paint our faces so creepy looking. It all started when my boyfriend decided not go on one of the rides and waited outside instead. 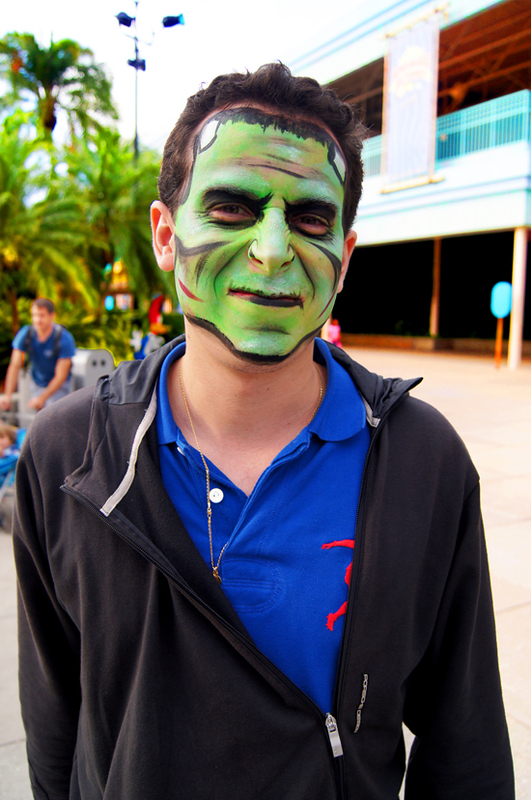 When we finished the ride and I walked outside to look for him, this weird green goblin came up to me and started talking to me. I was kind of uncomfortable with the creepy green demon.... until I realized it was my boyfriend! 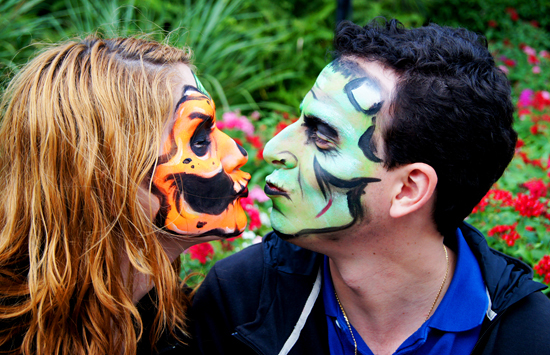 My boyfriend secretly painted his face while we were on the ride. I honestly did not recognize him! 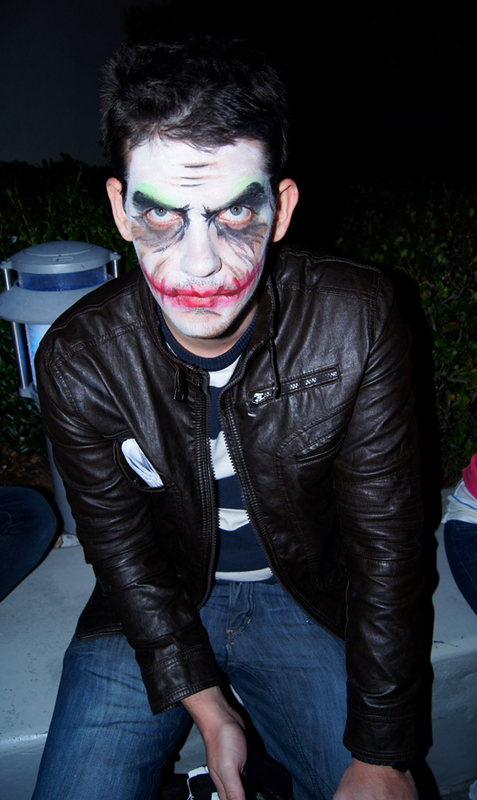 Even after I knew it was him, I was still felt kind of freaked out from his creepy makeup.... haha. My boyfriend's makeup looked so cool, that we all decided to paint our faces as well. 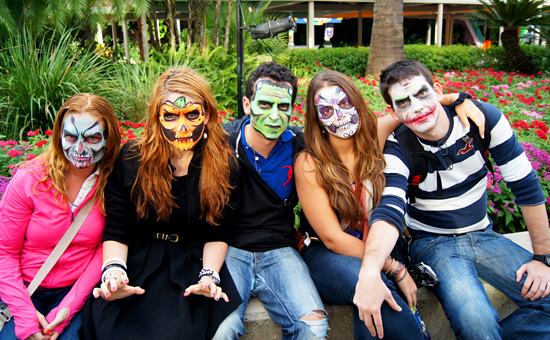 My boyfriend was Frankenstein, my sister was a Zombie, I was a Pumpkin, my brother was the Joker, and his girlfriend was a Skeleton. We were soooooo amazed at how good the makeup artists were! We all looked sooo creppy! We were definitely not the only ones who liked our makeup, since many many people throughout the night asked to take pictures with us like we were some sort of attraction... haha, we felt famous! hahaha. 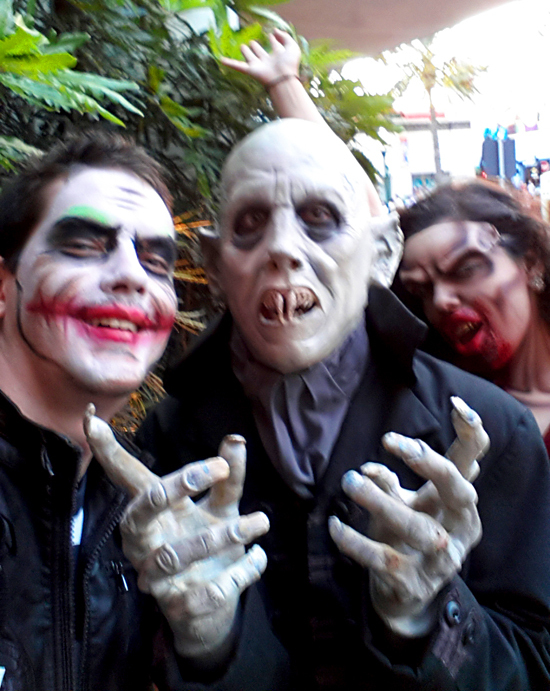 The Universal Halloween Horror Night was just amazing!! 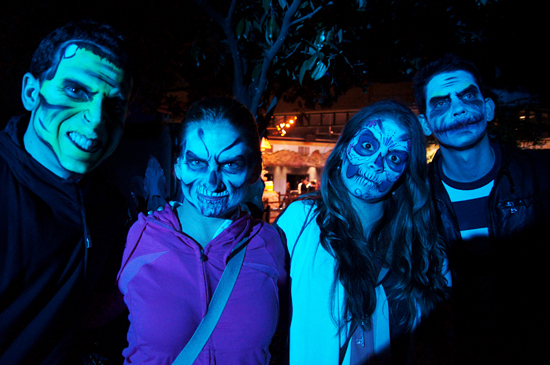 The whole event starts with all these spooky monsters walking the streets startling people. There were demons, rippers, vampires, etc. They would creep up on you when you weren't looking and scare you to death! 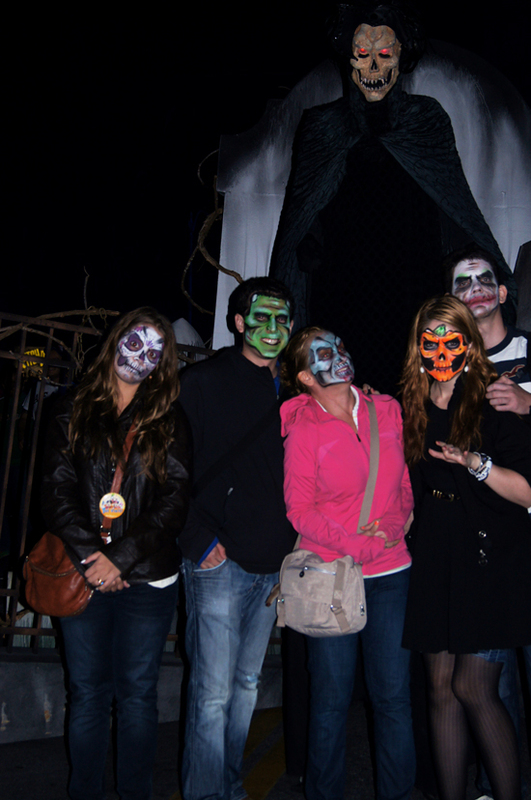 There were 7 different haunted houses throughout the park, and we saw 6 of them! 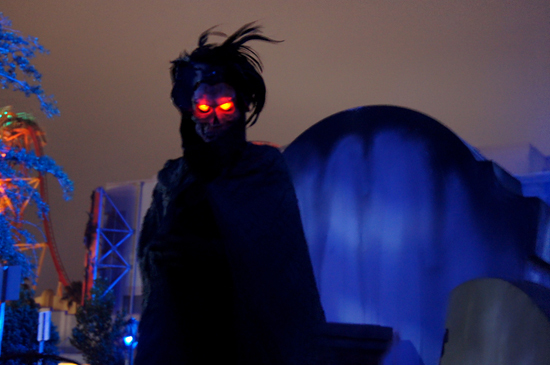 Some of them were actually not that scary at all, but two of them were really freaky! I admit that I screamed and ran in more than one occasion... haha. It was such a fun spooky night!! I would definitely love to come back for Halloween sometime in the future. 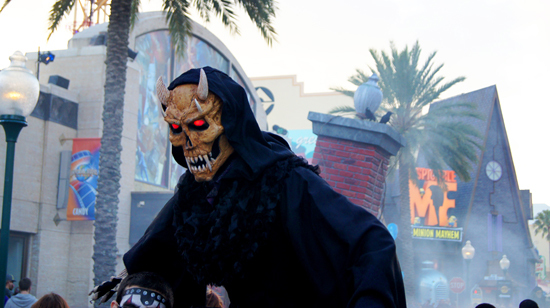 Have any of you every been to Universal's Halloween Horror Night? You four are totally genius and your faces really freak me out. 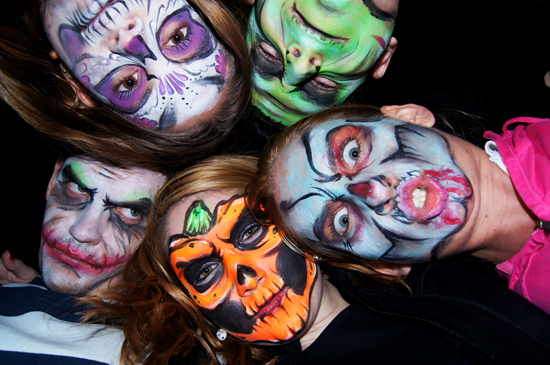 Wow, Marie, you guys look so scary! 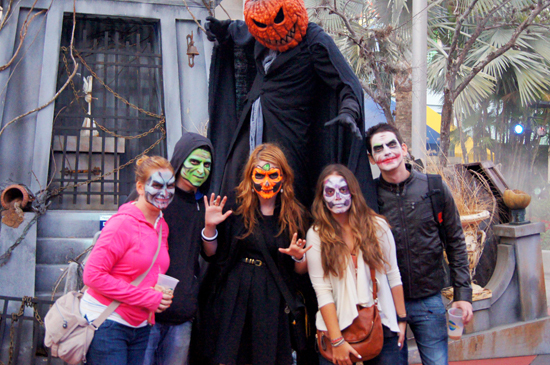 It's weird, you always look so friendly and sweet, but you make a very convincing scary pumpkin, haha! I agree with Ashley; those make-up artists must have been REALLY good, all of you look amazing! 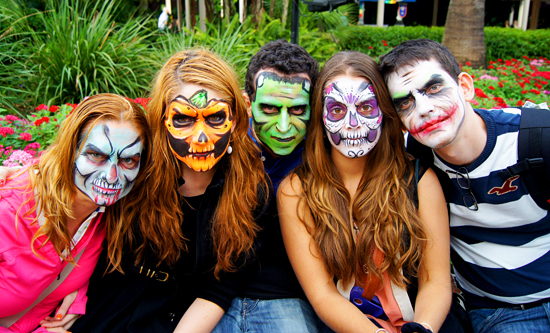 I'm scared so easily, so I don't think I will visit the park when it's completely in Halloween atmosphere, haha! I know, me neither!! I was sooo impressed that I couldn't help but try the makeup myself. Thanks for stopping by Ashley, have a fantastic day! So fun! Halloween is my favorite holiday, so this would be right up my alley. 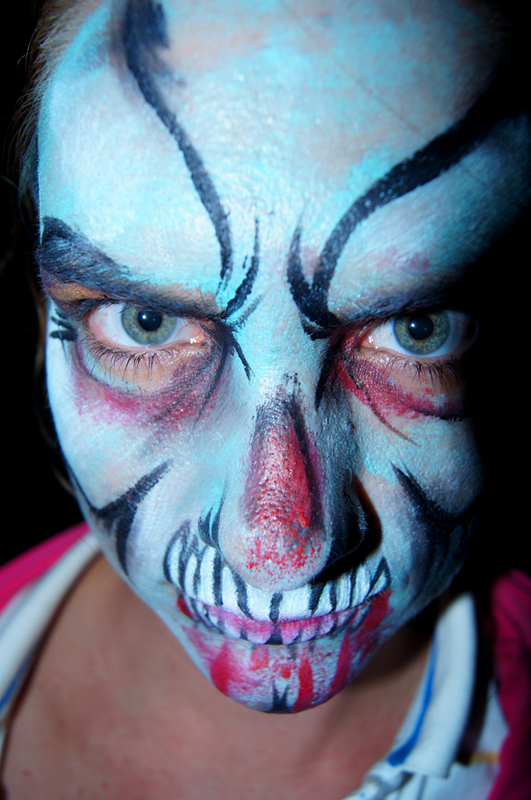 Love the creepy makeup! The makeup looks really good. Halloween is so much fun. omg Marie, that is too cool! 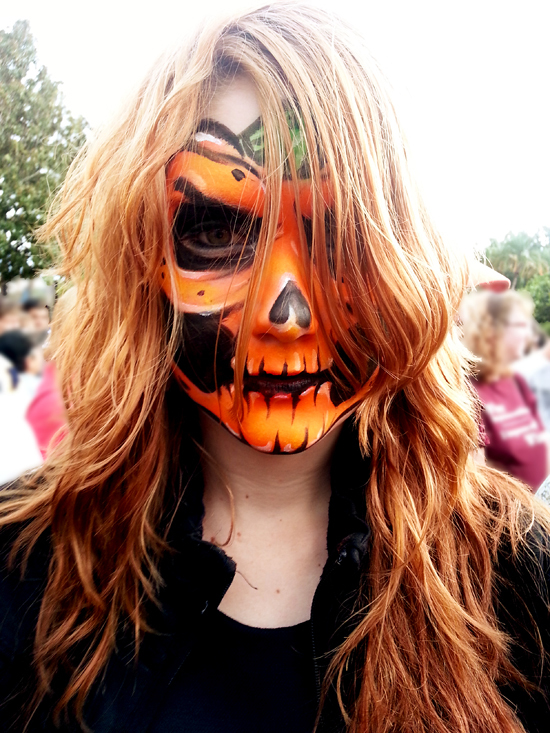 All your face paintings look AMAZING! And I love that last pic with you and your bf!!! You guys went all out and you look amazing! MARIE YOU'RE SO CREEPY!! ;) hahaha, but you look great! 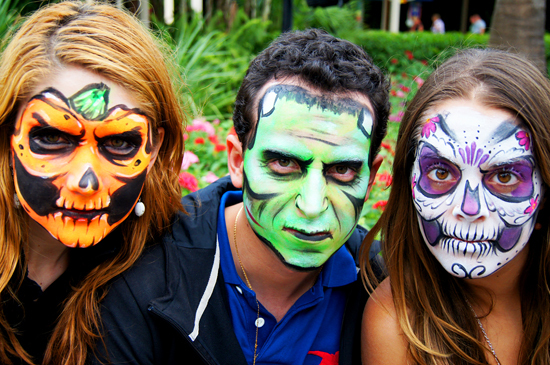 That's some impressive face-art you've got painted on you, yes indeed. This looks all so fun! It looks like you had a great vacation. That is some creepy makeup! The make up is amazing ! I love all of them, specially the skeleton one. Hahahahahaha I know right?!?! I twas weird to look in the mirror and see a mega creepy Pumpkin looking back at me. It was very fun indeed. Thank you! Hahaha yeah, we are just sitting there, drinking coffee, as if we everything is normal and we don't look like creepy monsters. LOL. Thanks for stopping by! Si man!! Fue verdaderamente frikeante!